According to the Kendo America, modern Kendo bears but a faint resemblance to Kenjutsu and to its feudal origins of sword-wielding samurai warriors which are today depicted in movies and television. 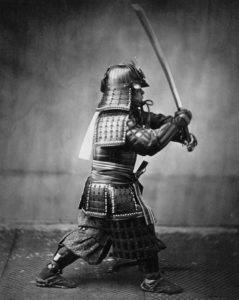 Kendo, literally translated, “the way of the sword,” cannot be traced to a single founder or given an exact founding date. The story of the rise of modern Kendo begins with the samurai and extends over the culture of several centuries. By the end of the 12th century, the authority of the Japanese central government had declined. Bands of warriors grouped together for protection forming local aristocracies. Feudalism had come of age and was to dominate Japan for several centuries. With the establishment of the Shogun in Kamakura and military rule controlling Japan, a new military class and their lifestyle called Bushido, “the way of the warrior,” gained prominence. Bushido stressed the virtues of bravery, loyalty, honor, self-discipline and stoical acceptance of death. Certainly, the influence of Bushido extended to modern Japanese society and Kendo was also to be greatly influenced by this thinking. The Japanese warrior had no contempt for learning or the arts. Although Kenjutsu, “the art of swordsmanship,” had been recorded since the 8th century, it gained new prominence and took on religious and cultural aspects as well. Sword making became a revered art. Zen and other sects of Buddhism developed and the samurai often devoted time to fine calligraphy or poetry. The next great advance in the martial arts occurred during the late Muromachi period (1336-1568) often call the “age of Warring Provinces” because of the many internal conflicts. This period brought an increased demand and respect for men trained in the martial arts. Consequently, many schools of Kenjutsu arose, eventually numbering about 200. Each was taught by a famous swordsman whose techniques earned him honor in battle. Real blades or hardwood swords without protective equipment were used in training resulting in many injuries. These schools continued to flourish through the Tokugawa period (1600-1868), with the Ittoryu or “one sword school,” having the greatest influence on modern Kendo. With the Meiji Restoration (1868) and Japan’s entry into the modern world, Kendo suffered a great decline. The Samurai class was abolished and the wearing of swords in public outlawed. This decline was only temporary, however, interest in Kendo was revived first in 1887 when uprisings against the government showed the need for the training of police officers. Later the Sino-Japanese War (1894-95) and the Russo-Japanese War (1904-05) again encouraged an awareness of the martial spirit. Consequently, in 1895, the Butokukai, an organization devoted to the martial arts was established. In 1911, Kendo was officially introduced into the physical education curriculum of middle schools and in 1912, the Nihon Kendo Kata, a set of regulations for Kendo, was published. In 1939 as Japan prepared for war, Kendo became a required course for all boys. After World War II, because of its nationalistic and militaristic associations, Kendo was outlawed and the Butokukai was disbanded. However, by 1952, supporters of Kendo successfully reintroduced a “pure sport” form of Kendo, called Shinai Kyogi which excluded the militaristic attitudes and some of the rougher aspects of practice characteristic of pre-war Kendo, into the public schools. Today, Kendo continues to grow under the auspices of the All Japan Kendo Federation, the International Kendo Federation, and federations all over the world.